There’s nothing like a broken bone and a car break-in to remind you what’s really important in life. Last week my car was broken in to and my son broke his arm. Not that these two events are comparable, exactly, but they both reminded me that life can throw curve-balls at me anytime and it’s important to be ready for them. “Always be prepared,” and all that. For a planner like me, knowing that life is unpredictable can be, let’s say, daunting. I have lists planning the next 3 days, the next month and, for some things, the next year. I’m not good with the unexpected. You’d think I’d be ready for anything, what with having three kids. But we’ve been lucky and there hasn’t been much of the unexpected going on around here. (tfu, tfu, tfu, as some Yiddish speakers might say) My kids almost never miss school, our cars almost always start, and our appliances almost always work. But last week, my friends. Last week threw me for a loop. I know in the grand scheme of things the events of last week were pretty mild by most people’s standards. For some, they were simply blips. My son’s arm is pretty serious but treatable and he is so strong and so brave that I am in awe. But the amount of rearranging and rescheduling that had to take place from these seemingly minor events turned my world around a bit. The changes to our schedule weren’t major but they were changes nonetheless and I had to get serious with myself about how, under certain circumstances, my worries about sticking to routine were unimportant and unnecessary. I lived without a credit card for a week (even though it left me unable to pay for the sling at the hospital as they didn’t accept cash); my husband had to leave work early so I could stay at the hospital with The Boy; we served cereal for dinner (which my kids preferred over the salmon that we adults were having); I canceled my volunteer slot at my daughter’s school (there are over 500 mothers that could probably replace me); I delayed the launch of my website (it’s been 6 months in the making – what’s another day or two?). No biggies. And I realized that even the things that couldn’t be rearranged were not reason for panic or stress. “I still need to make sure my family is fed every night even though I can’t get to the grocery store?” No worries. Pizza it is! “We still need to try to get some sleep, even while being available for our son in the middle of the night?” Why yes, that mattress on the floor of our son’s room will work just fine. Boy did this week teach me about routines, and emergencies, and how I deal with both. As much as we rely on our routines and schedules, most of us know that anything can happen, and we are subconsciously braced for it. Make the back-up plan part of your routine. Get comfortable asking your neighbors and friends for help on days when it’s a favour, not an emergency. Your People are the ones who will drop everything to bring your son PowerAde and games because they know how bored and scared he must be. Your People are the ones who call and text and send messages when they hear that your son got hurt at school. Your People are the Teachers and Principals that stay in touch and worry almost as much as you do. Your People are the Paediatricians who call from home after their work day to check how the hospital went (even though you should have been the one to call them). Your People are the ones who arrange for a specialist to see your son because they want to ensure that he has the best treatment possible. Your People are priceless. Even when Especially when things don’t go as planned, take a moment to appreciate everything that does go right. There are so many days when everything does go the way we want and we barely acknowledge them before moving on to the next item on our list, the next carpool, the next business meeting. We need to stop ignoring those days. At the end of those kinds of days – when everything just flows – say it out loud. Tell someone. Tell your friends, your kids, your partner (tell the whole bunch!). It’s amazing how just acknowledging the regular, boring, no-surprise days can help you on the days when life whacks you upside the head. Last week, my new normal became giving my son Morphine and/or Advil every 4-6 hours. You can bet I’ll appreciate when I can get back to worrying about whether he brushed his teeth before bed. Great post and wonderful reminder about the importance of being flexible and going with the flow (even if we don’t really like it!). 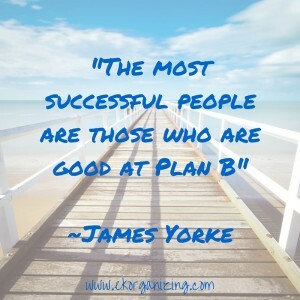 Sometimes our plans just don’t work out the way we want, but if we can learn from them and help others then it was worth it! Take care! Thanks Liana. It’s taken me 4 decades to even approach being called flexible;) It’s a work in progress. It’s amazing how much something small (or large) can throw us for a loop. I love your description of depending on “your people.” I’ve had several emergencies that have required me to depend on my people. It’s amazing what a comforting feeling that can be. Thanks for sharing. So happy you had your people, Andi. The comfort in knowing that your people have your back is indescribable. This blog post so reminded me of myself, I too am a planner weeks. months, years, with every perceived outcome predicted. What I have learned is life likes to laugh at my planning, so I, like you have had to adapt when my plans have gone haywire, What these times have shown me are how flexible I actually am, and to let go of perfectionism. Great post, and I hope your son heals fast. Thanks so much, Jill. What you wrote rings so true – I learn every day how much better I am today than even last year when it comes to dealing with the unexpected. I like to think I’m pretty flexible, but this is a great reminder to not just be open to changes in routine, but to actually be prepared for them. Thank you for sharing your story. Hi Janet. For someone like me, who struggles with changes in routine (or any change, really), trying to plan, even for the unexpected, helps a lot.